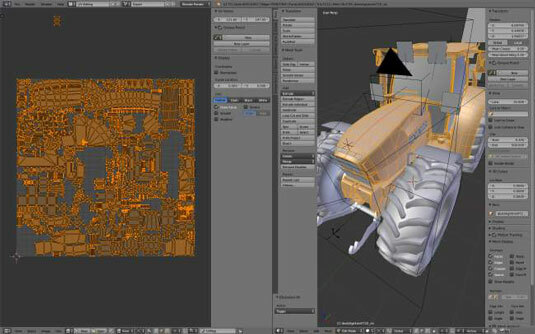 Before you can texture your Farming Simulator model, you need to unwrap your mesh. Unwrapping is the process used to map a pixel’s location on the image to a corresponding location on the mesh in 3D space using UV coordinates. Imagine taking your mesh’s surface, flattening it out, and positioning the pattern of that flat chunk on a canvas you plan on painting. That pattern defines your UV coordinates. To understand unwrapping, think about how mapmakers make world maps. Longitude and latitude lines form a grid (a mesh, if you will) around the globe’s surface. You can then define one or more of those lines as seams, along which you can split the surface and flatten it to a map. Cartographers were the world’s first 3D texture artists! 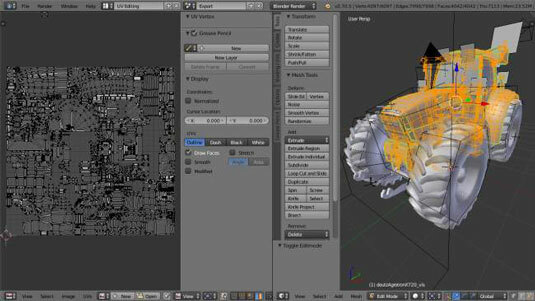 In Blender, unwrapping a single object is really quite easy. To make your life easier, you may want to switch screen layouts to the UV Editing screen. You can quickly get there from the Default screen by pressing Ctrl+Right Arrow four times, or you can use the Screen layout drop-down menu at the top of the Blender window. Select the object you wish to unwrap. Toggle into Edit mode (Tab). Switch into Edge Select (Ctrl+Tab→Edge). Select the edge or edges you want to be treated as seams. Mark the selected edges as seams (Ctrl+E→Mark Seam). Select all (press A until everything is selected). Tweak the UV layout in the UV/Image Editor to make the most use of the available space without allowing for any overlaps. You may need to repeat Steps 5–8 a couple times to get the layout you like. Unwrapping in Blender does have one complication. Blender currently doesn’t have a nice way to unwrap multiple objects at the same time. Because most of your objects in your mod have to share the same material, it means they also must share the same texture. So the UV coordinates for each object have to be arranged in a single layout without overlapping. But because Blender can’t have more than one object in Edit mode at the same time, there’s no clean way to see or edit the UV coordinates of all objects at once. The easiest way to do it is to join all of your meshes into a single object like you do for the windows. This solution is the quickest and easiest. If you need objects to be separate in GIANTS Editor for specializations or animation, you can always reseparate them after you unwrap. Doing so only gets complicated if you’ve used a lot of modifiers to create the various objects in your mod. You’ll need to apply those modifiers prior to joining, which is fine if unwrapping is the last step in your process, but it may make it difficult to edit your object later.